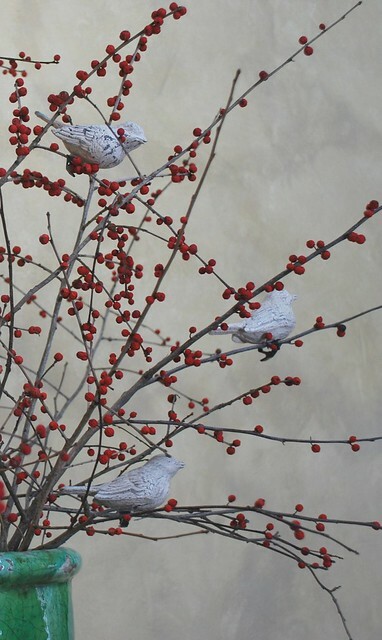 for the long winter ahead, is both an easy, and a favorite thing of mine (I have many ;)! Every year different things catch my eye, and this year, one of those things was our hydrangeas! rest of the year as well! beautiful hops flowers … hops wreaths are one of my favorite things. to have a place of honor among the hydrangeas. their beautiful deep shades of autumn colors. 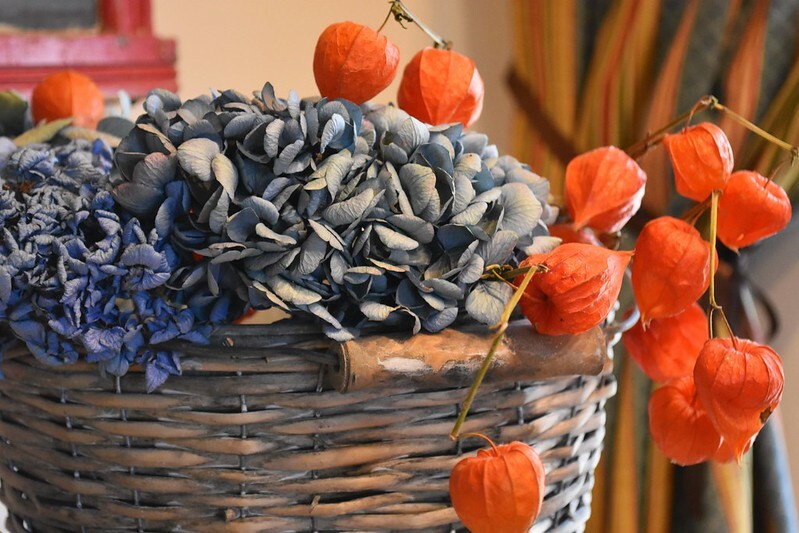 lanterns give the arrangement such an unexpected pop of color! first clock that I took completely apart & fixed. Here’s another recent cuckoo clock I repaired. I’ve repaired 3 so far, and have 3 more in various stages of repair. I love cuckoo clocks… they’re a favorite! 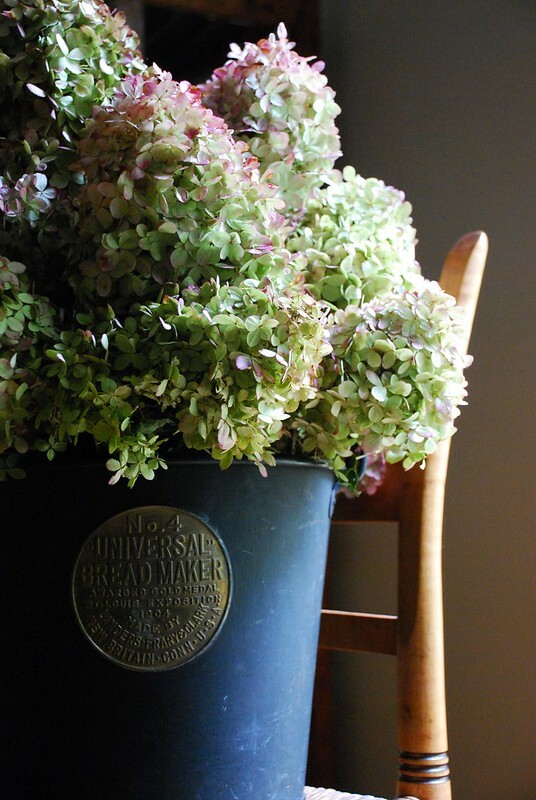 of the vintage bread bucket we found at the antique show this year. They add such life to our home! family & friends that God has so graciously blessed us with. When you can enjoy the little things in life, each day will be so full, that you can lay your head on your pillow knowing you’ve left no joy unturned. We made It! Here in Upstate NY, we’ve just lived through the coldest February in history. Everyday I hear people complaining about the temperature, the snow, and numerous other thing. All I can think of is… their days must be terribly exhausting! It takes so much energy to continually find fault with the world, when they could be spending their days with a smile on their face, and a heart that is not only thankful, but satisfied with the many blessings in our lives. Today, even though it was cold outside (we had -24 last week, and that was not windchill! )… the sun was shining & I had eyes to enjoy it. The birds were singing & I was blessed to be able to hear them. Our home was filled with family & laughter, which is one of the greatest joys of all… and so much was right with our world! Even though I realize that true joy does not come from “things”, I wanted to help inspire you to enjoy the little details of your life. 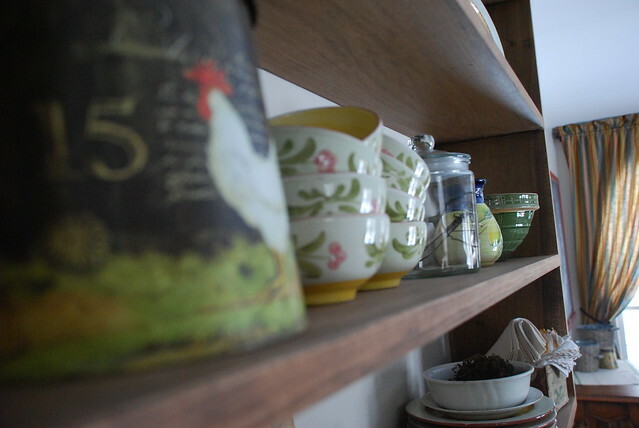 So, I decided to take you for a walk around our home & share some little details that bring a smile to my face. If we’re not careful, we can spend so much time waiting & looking for the big things, that we miss out on all of the wonderful little details & joys in our day. Beyond the windows on the back side of our home, we can watch the river as it flows through the forest. It has been so cold this year, that the top of the river has nearly frozen over. Add to that, the several feet of snow that we’ve gotten over the past few weeks, and we can now see what we’ve never seen before… the river totally covered over! 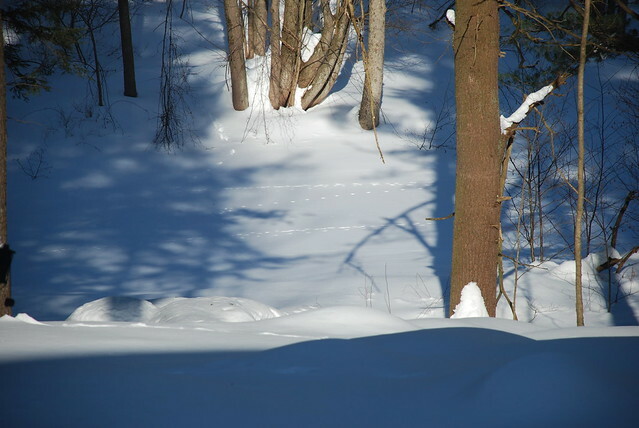 But this has also given way to another sweet surprise, we can now see the footprints of all the animals that share our little forest! 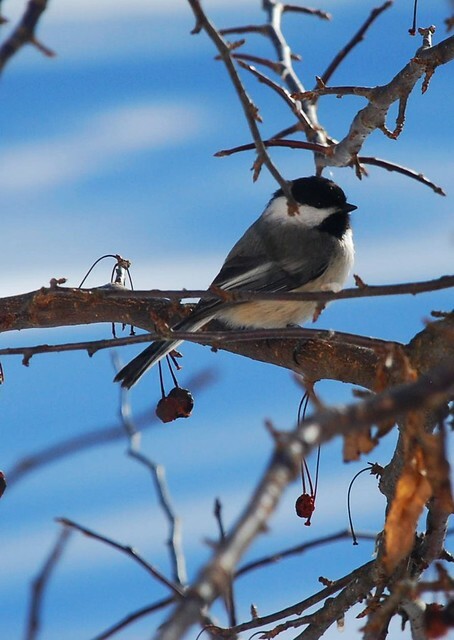 Cold snowy weather also brings lots of different kinds of birds to the winter feeders! How precious is this little chickadee! 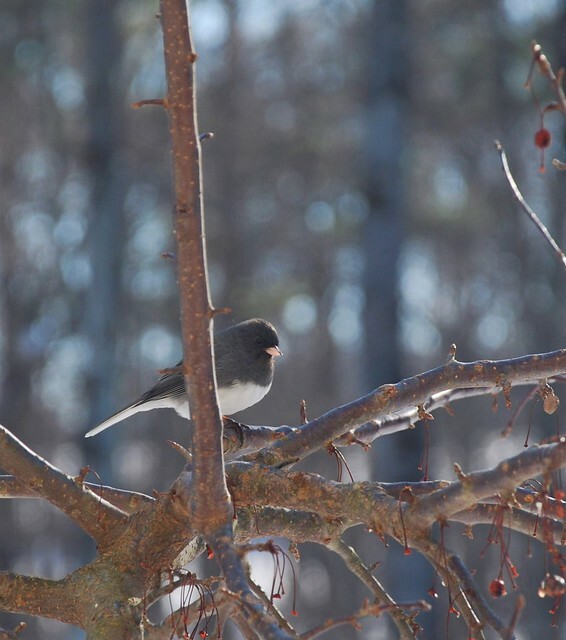 And this gorgeous little Junco. 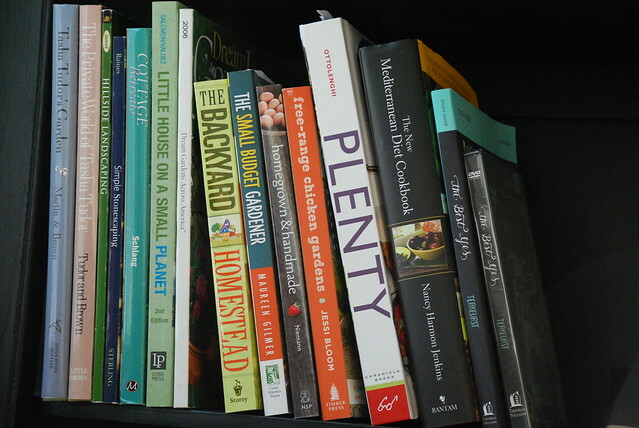 A shelf full of great books to read while inside. 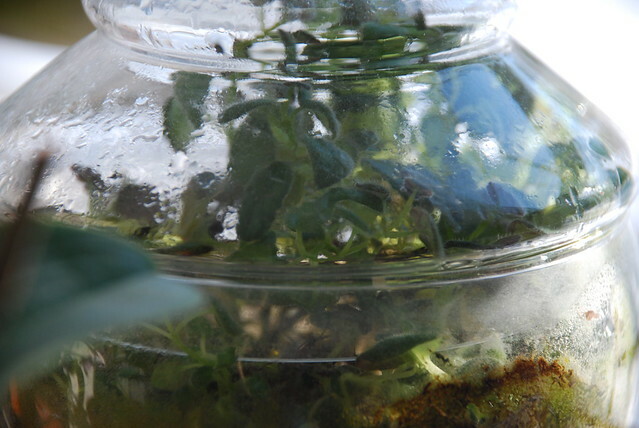 No matter how big or how small, there’s something so satisfying about having a terrarium! I like to imagine what it would be like to live inside…in a tiny little cottage 🙂 This one is filled with miniature sinningias… one of my favorite plants! 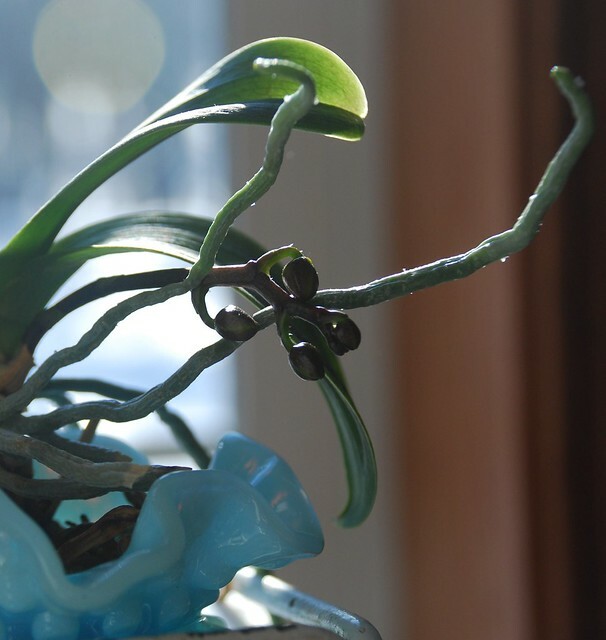 I have a shelf on my plant stand dedicated to my tiny orchids, and I just love the tiny little buds that they all have right now! 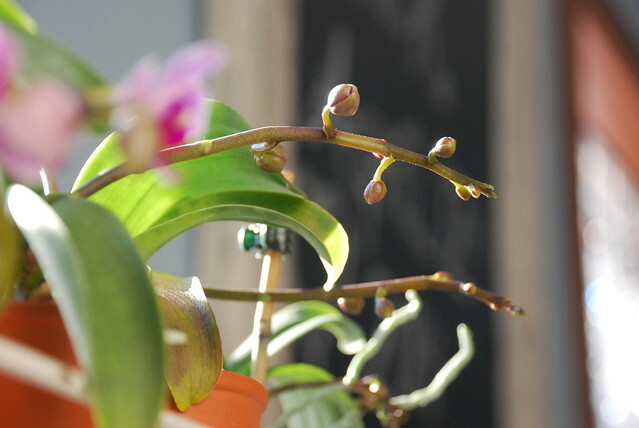 This wee little orchid, with wee little buds, in a wee little fenton glass vase… one of my favorite things. 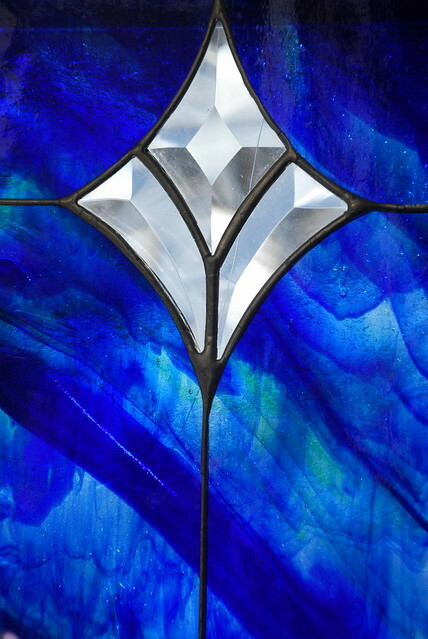 Don’t you love the deep blue colors of this piece of stained glass! My dear friend Diane made this piece, and we love the color it gives to the room, as the light spills through it! 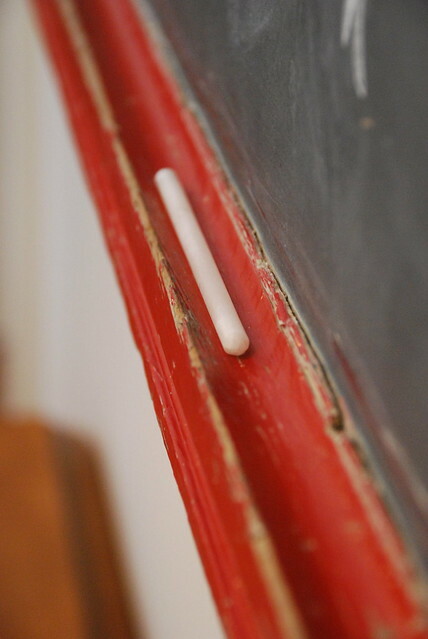 Soapstone chalk…one of my new favorite things. It was part of a gift given to me by my daughter Casey & her husband Zack for Christmas. 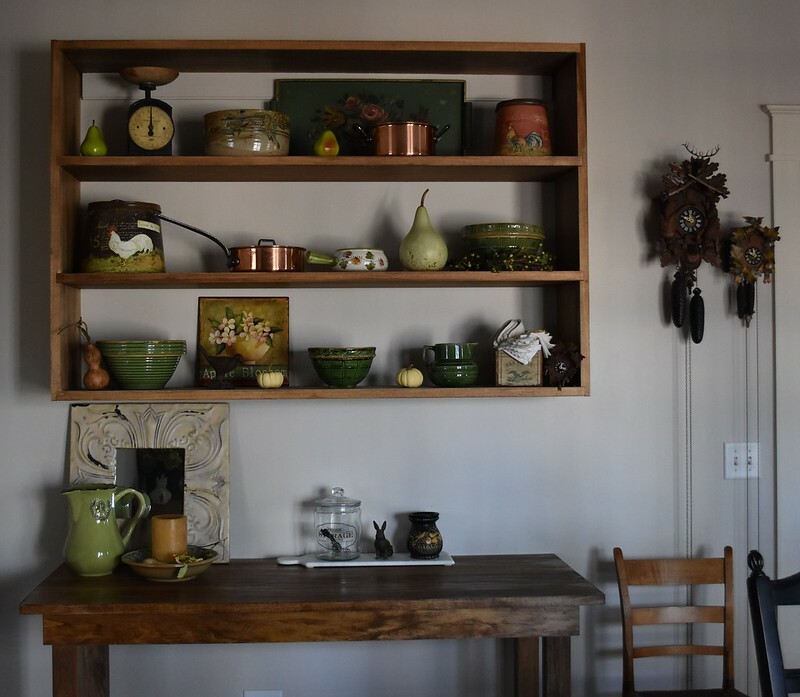 My husband made this set of shelves for our dining room, and every season I “shop” through my cabinets & find things to decorate with. 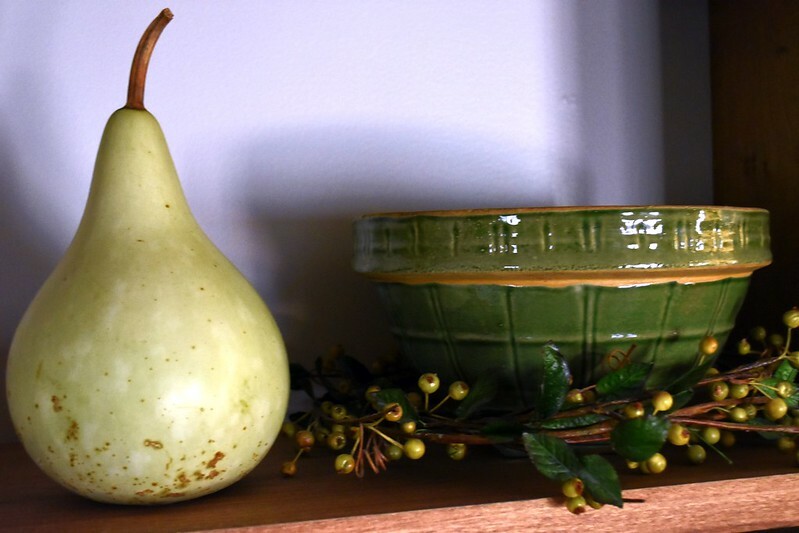 In preparation for spring I decided on pear green as this season’s accent color, so my pottery dishes (another Christmas gift from my husband many years ago) are the perfect compliment. 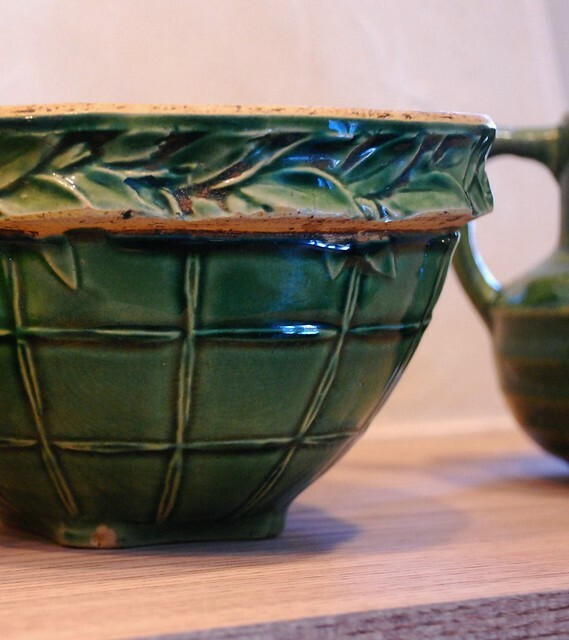 The deep green glazing on the rim of this little McCoy piece is so beautiful. I even love the little chips, where the yellow ware clay peeks through! 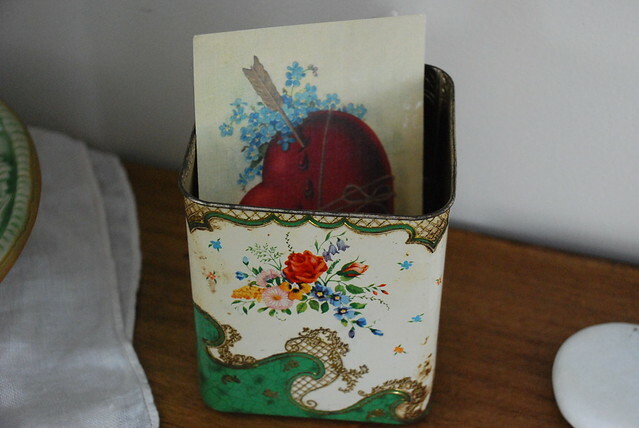 I found this sweet little vintage tin & vintage postcards at the same lovely little shop. Since it has beautiful green markings, I had to use it. Olive Oil – there was something so beautiful & satisfying about this bottle of olive oil, that out of everything in the store, I used my gift card to buy it. I’m not sure if it is the beautiful shape of the bottle, the gorgeous color of the oil, the delicate wax seal, or the ornate metal label that caught my eye. I have a feeling it was all of the above! 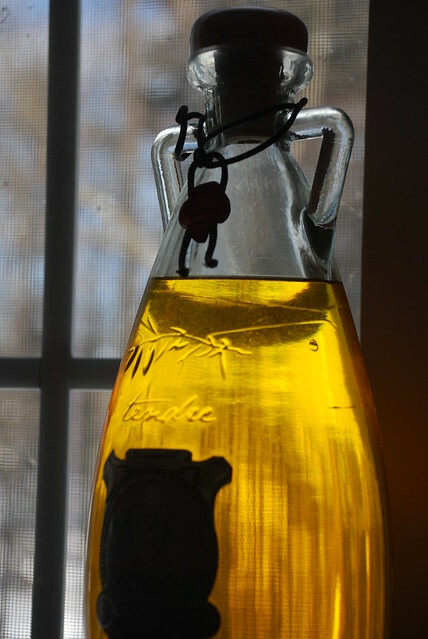 I just know I love the way it looks on my kitchen windowsill, with the light shining through the oil! This little stained glass pear was made by the same friend who made all of my other stained glass pieces. 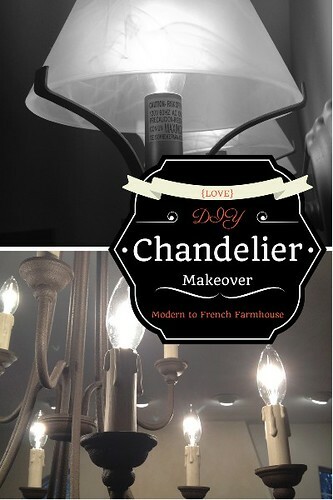 Thank you Diane, for providing so much beauty & enjoyment in our home! And… since it IS a pear, it had to be here. This lovely handcrafted platter was another Christmas surprise from my husband. 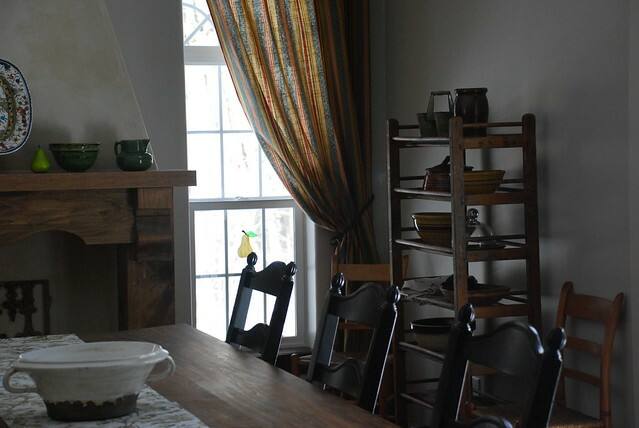 A few years ago, we saw it while wondering around a beautiful kitchen shop. Noticing how much I admired the hand painted woodland scene on it, he went back & bought it for me! He’s such a love!! The scene is filled with animals surrounding a castle in the deep forest. 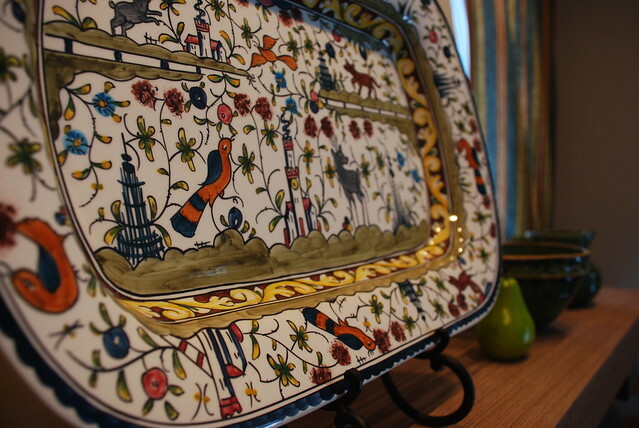 The folkloric design is from the 17th century, & is handcrafted in a small Portuguese pottery. I also love the black matte finish of the wrought iron display rack. Each time I walk by, I admire the hard work of a skilled artist from a little pottery far away, and the love of my husband & joy on his face when he was able to surprise me with something so beautiful. 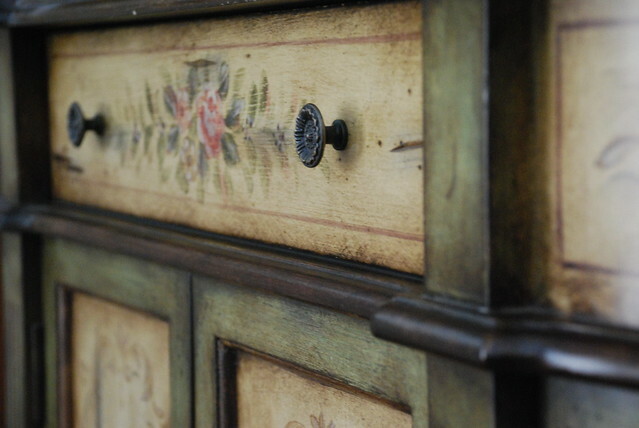 Painted furniture is one of my favorite things, and I love the details on this piece. This handcrafted pitcher was a piece that I won in my early days on the web. Helping others build their business was/is my business, and this was a special gift from those early days. Don’t you love those pops of green! 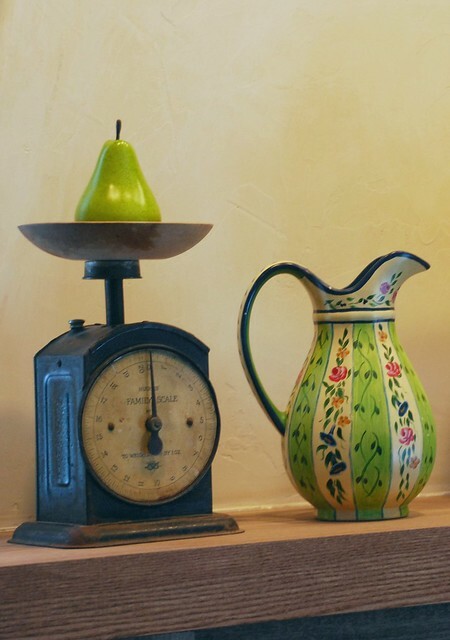 And of course…there is an actual pear sitting on top of a vintage scale that I found while digging through a junk store. 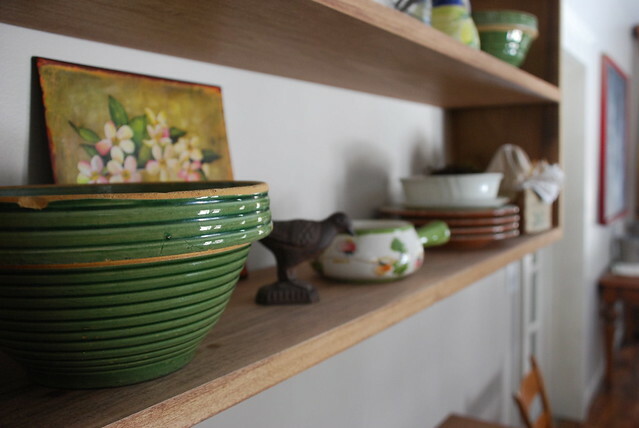 The little wooden butter bowl was a surprise discovery in the bottom of a $1 box at auction. 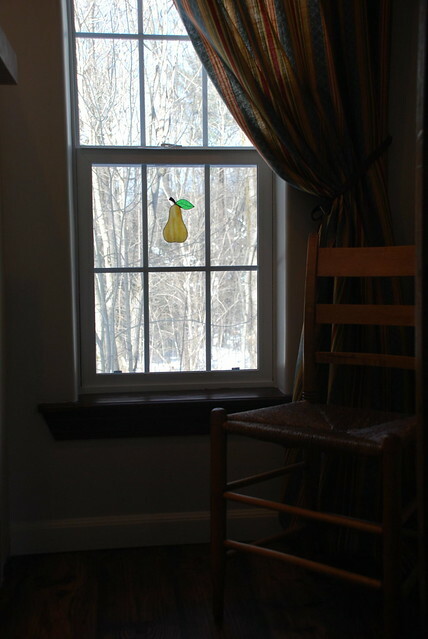 Here you can see the new curtains I made for the season. Years ago, I found a great discount fabric shop filled with beautiful bolts of fabric! At those ridiculously cheap prices, I had to pick up a few of my favorites, knowing I’d find a way to use them someday. Well, this pattern has finally had it’s someday as our new spring curtains! 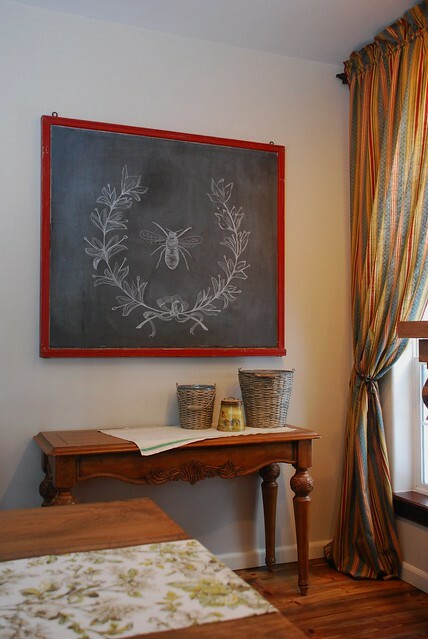 The gorgeous chalkboard was a favorite find at an auction last summer, and the picture is me pretending to be a chalk artist 😉 I do love it though, since the “bee in the wreath” graphic is one of my favorite things. 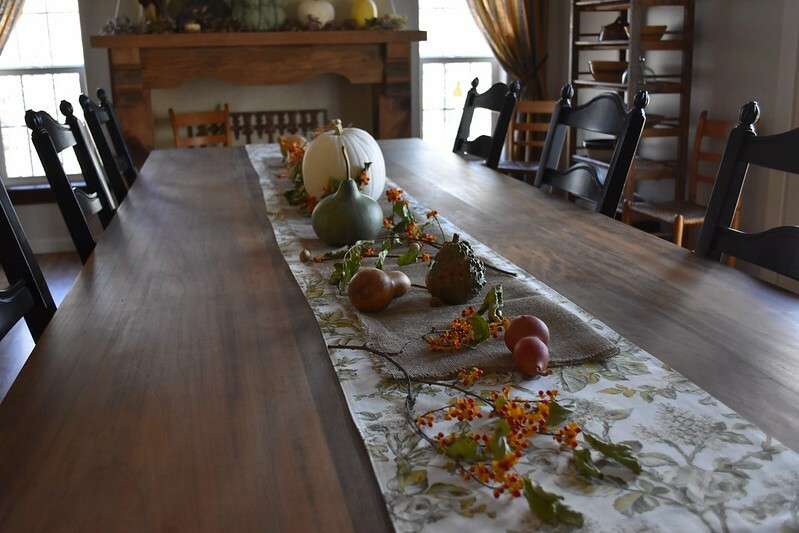 The vintage linen with the green stripes was a $1 find last fall, and the table runner with the lovely shades of pear green was a new find. Sometimes joy jumps at you with surprise, and sometimes you must go on a joy treasure hunt! While you’re spending these longer cooler days inside, they don’t have to be void of joy! And, it doesn’t have to come in big expensive boxes. 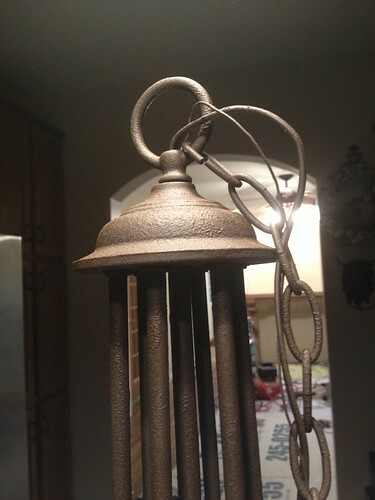 Sometimes it can come in a surprise $1 from an auction, something you found on the curb & re-purposed, or even in something you’ve made yourself. 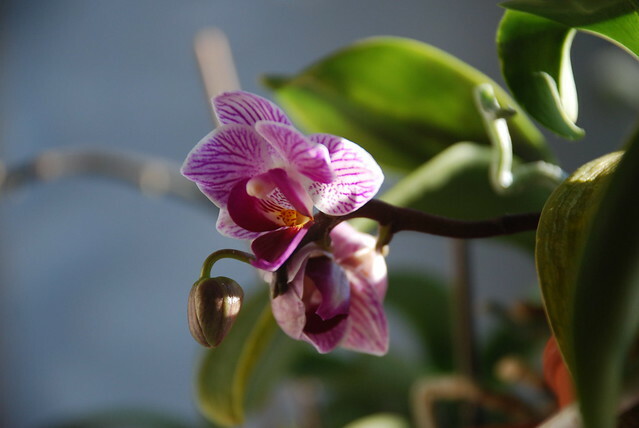 I hope you’ve enjoyed this walk around our home looking at a few of the “little things” that bring me joy each day, and may you take time to enjoy the little blessings in your home! There’s something about old rusty bits from home & farm that warms my heart. Perhaps it’s the stories that a piece could tell, the work that it has seen, or maybe just the fact that it’s still here to tell the tale. 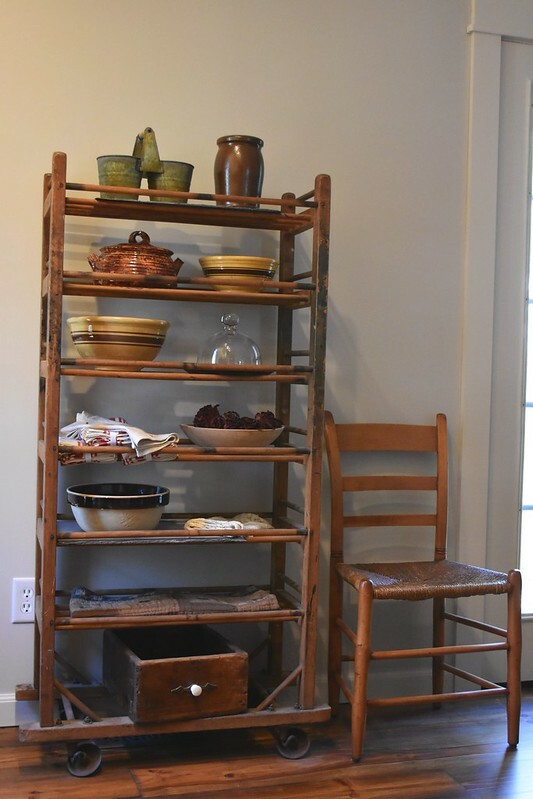 In any case, when my husband & I decided to turn our standard builder’s grade family room in our new french farmhouse dining room, I knew we had to include some special rusty bits of our own to tell a story in our space. As I took time in the room to try to visualize the finished space, every time I looked at the ceiling fan, I knew we had to have something else in it’s place. 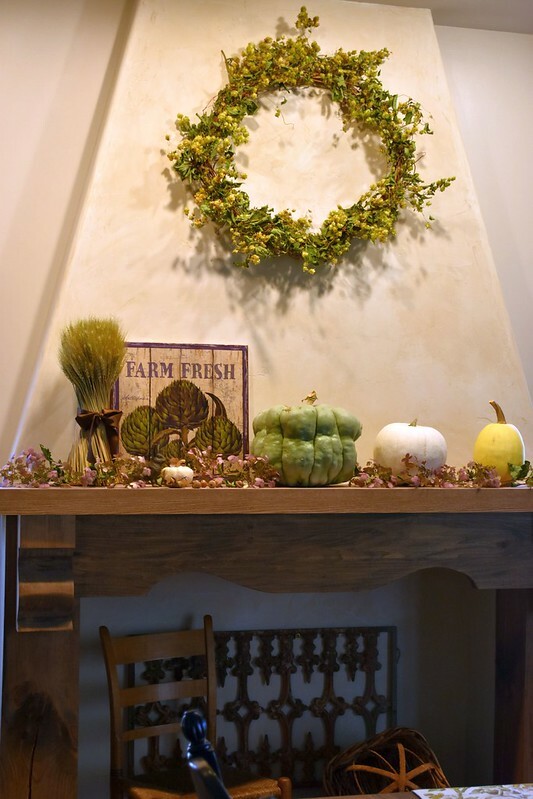 Something that would speak “french farmhouse” as our family sat around our soon to be harvest table. But what would I replace it with? First of all, I couldn’t seem to find “the right piece”…not at a price I could currently afford anyway. So what was I to do? 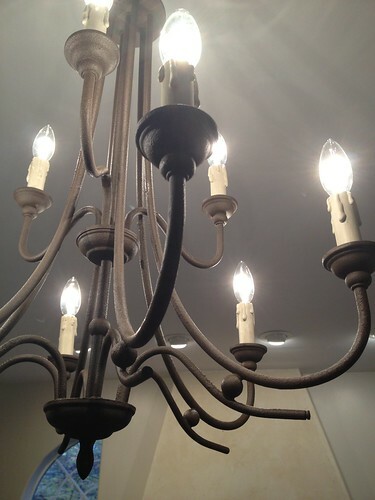 I had a chandelier downstairs that the builder left with us for another room, but because we picked something different, it was still in the box. 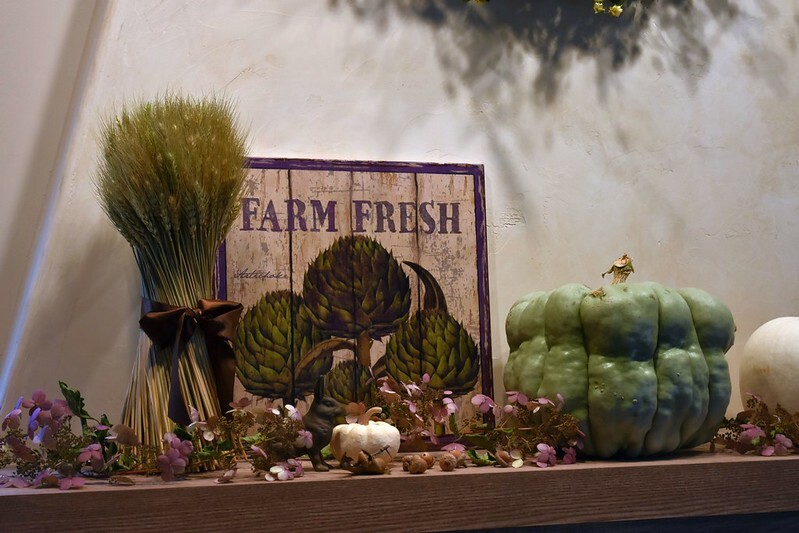 It was not my style at all – shiny, modern, new… but perhaps I could do something with it, to give it more of a french farmhouse feel. It was worth the try. And after all, it had been sitting in a box for years anyway, so what could it hurt? 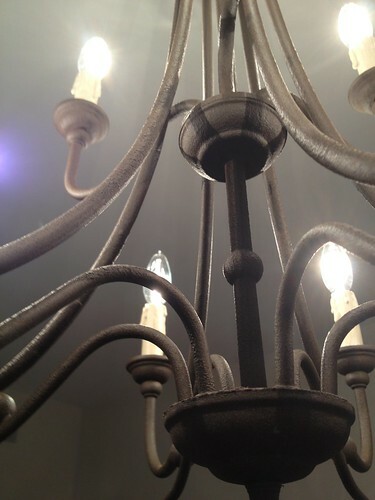 I wish I had taken a better “full” picture of the chandelier before I started, but you can get somewhat of an idea by this picture. The fixture isn’t terrible, it’s just not my style. Shiny. Modern. New. 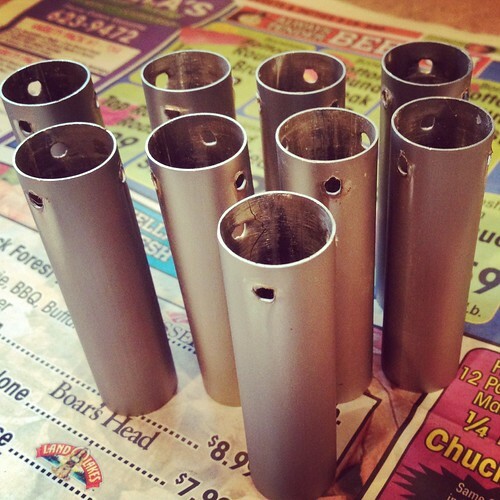 I removed all of the shades, and as I was pulling the metal tubes up, I realize that they were all welded together! How was I going to get all of these little metal arms off of the tubes? I didn’t expect each arm to leave a hole in it’s place. Now what? I had no idea if this would work, but I decided to get out my hot glue gun, & make what looked like wax, dripping down from each hole. It stuck well enough, and I think it might work! 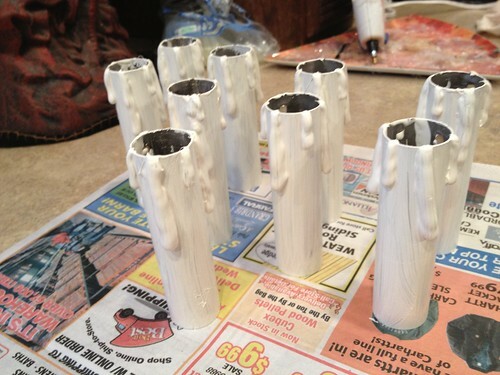 All I need to do now is paint the tubes to look like candle sticks. I found a small bottle of antique white craft paint that I had & tried that. They looked nice, but still needed a little something. 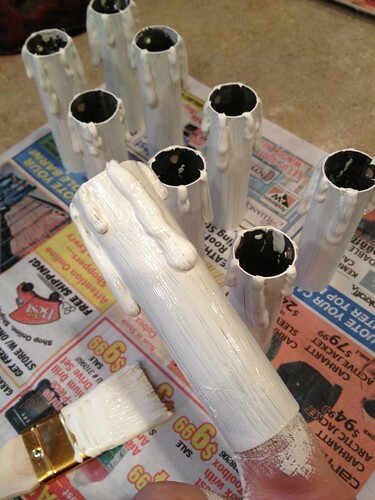 So after the paint dried, I dry rubbed a little bit of antiquing glaze over each tube, that really did the trick! The can of spray paint is the only thing I had to spend money on, as I already had the other bits of paint & hot glue left over from other projects. 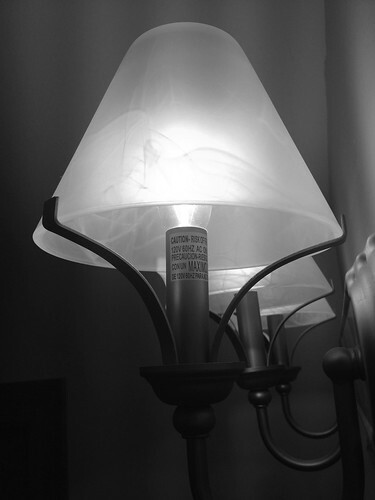 Before you paint a light fixture, be sure to protect the electrical areas with something. 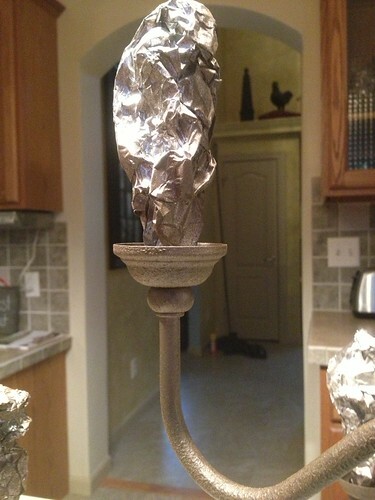 I used tinfoil because it was so easy to do. Be sure to protect the area from over spray & paint in a well ventilated area. I did mine outside. Here’s a close up of the top. 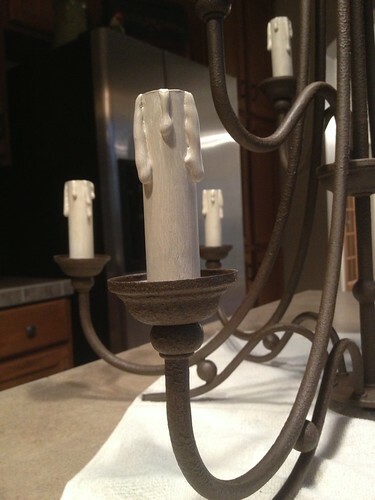 You have to be careful to cover all parts of the fixture when you’re painting. I used a cardboard box to sit mine on while I was painting it, that way I had both hands free to work. 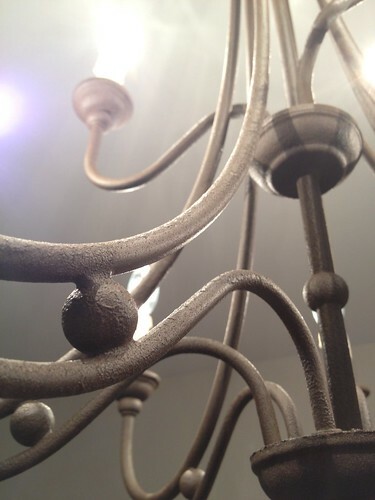 Here’s a close up of the metal light tubes – glued, painted, antiqued, and put back on the fixture. I love the way they came out! 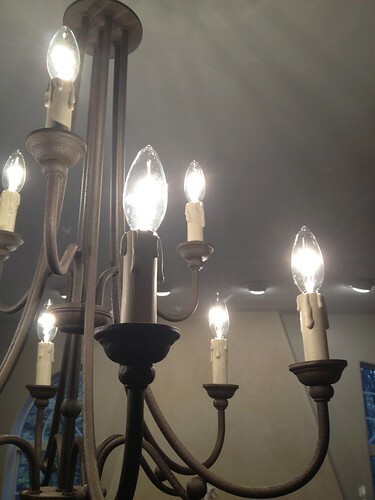 The chandelier is now installed & the bulbs are in! What an amazing difference a little creative thinking, paint, and other bits can make… and for very little money I might add! What can you think of in your home, that just doesn’t seem to fit with your vision of how you want the space to look? Can you give it a makeover to make it work? Of course you can!!! Tell us about it & share this DIY with your friends to help inspire them as well!